Want to drastically increase the number of fans or followers to your social networks? Use our Social Media Promotions services to do just that. 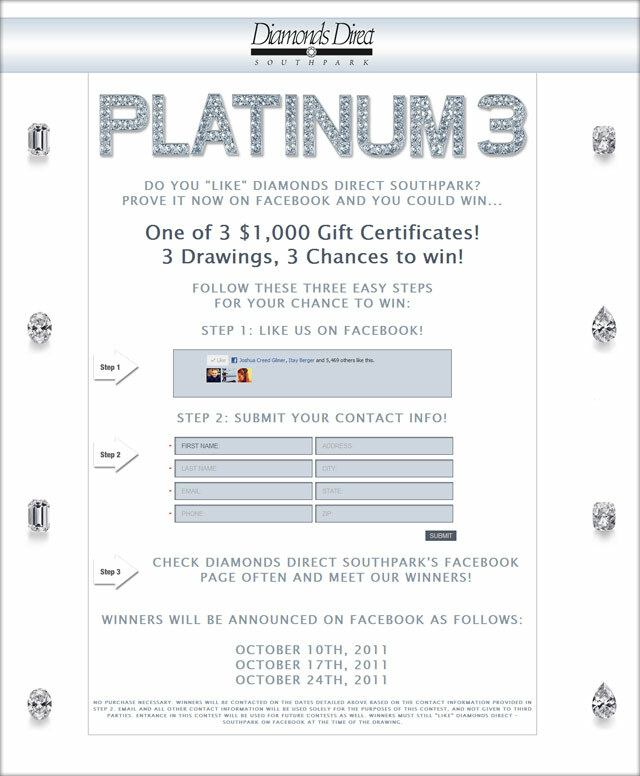 It’s how we increased Diamonds Direct SouthPark’s Facebook fan page from 300 “likes” to over 5,000 in under three weeks. Businesses are becoming savvy to the benefits of spreading their marketing content on social media sites. But before you publish, post, update or tweet, you need someone on the other side reading your marketing material. The benefit of a social network is that these readers can engage, share and subsequently extend the viral reach of your message. Huebris’ Social Media Promotions are all about growing your audience on social networks to increase the potency of your social media marketing endeavors in the future. We do this through social media contests, sweepstakes and more. And we do it through means that are legitimate, compelling and legal. Facebook stipulates in their terms of service that users are not allowed to use the social network’s mechanisms to run contests. So why do we always see social media competitions created and advertised on Facebook? The secret lies in Facebook’s custom tab feature. If the contest is hosted outside Facebook, and the mechanisms by which the sweepstakes are set up exist outside Facebook (e.g. the ability to enter, contact the winner, choose the winner, etc. ), then the marketing device is completely legal as far as Facebook is concerned. Huebris can build these kinds of micro-sites for Facebook promotions. We can also help you decide on appropriate prizes, timetables and goals for growth. We’ll host, moderate and close out the competition, leaving you with no social media marketing chores—just an army of fans! What your business does with this power is your own business, but we hope you will enlist Huebris to spread your marketing messages after you’ve amassed an audience of fans, followers and “like”-ers. Not all our Social Media Promotions are strictly contests. Huebris can also set up and maintain hard cost advertising campaigns on sites like Facebook too. We work with businesses to develop 10 different variations of the proposed ad copy and imagery, and then tweak the advertising campaign to maximize your return on investment. Advertising on social networks can be daunting, but we equip our clients with all the tools to succeed. We show you how to measure results by creating hooks that will show up on your own website’s analytics solution. On a side note, you should never ever commit advertising dollars to pay-per-click campaigns without having at least one analytics solution installed on your website. Social media contests are a great way to increase your reach. Growing your audience only gets easier as you get bigger. It’s a phenomenon we call “Social Proof.” To help your social media marketing efforts accelerate, turn to Huebris and our Social Media Promotions services. If you have questions, we’re ready to answer them. Are you ready to grow your social media audience? © 2019 Huebris All Rights Reserved.